Call it a penalty, call it a tax. Call it a “penalty tax” as the Congressional Budget Office (CBO) has. Call it what you will, we’ll just call it ‘devastating’. President Obama’s health care law raises taxes by $1 trillion, according to a new report from the Congressional Budget Office. The individual mandate — which the CBO calls a “penalty tax,” in apparent deference to Chief Justice John Roberts — will produce $55 billion in “penalty payments by uninsured individuals,” the CBO told House Speaker John Boehner, R-Ohio, in a Tuesday letter. Of course, the framers of the law didn’t design the mandate as a tax, and so it produces less revenue than any other provision in the bill. The “additional hospital insurance tax” is the largest tax increase in Obamacare, projected to bring in $318 billion in new revenues. According to the 2010 report from the Journal of Accountancy, this tax hits “high-income tax payers” — individuals making over $125,000 a year or households making over $250,000 a year. It may hit so-called high-income tax payers, but it will most certainly have an effect on lower-income families as well. With high- and low-income earners alike having to worry about massive tax increases, the Obamatax should do wonders for the economy, particularly in the areas of spending and consumer confidence. 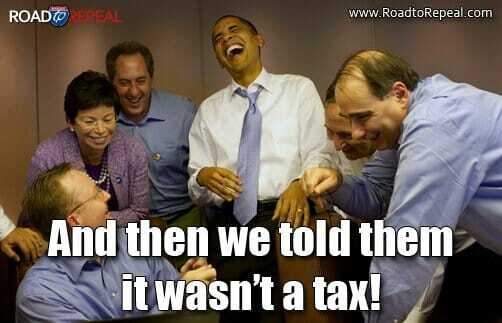 Here is a video reminder of Obama saying, “You don’t raise taxes in a recession”.